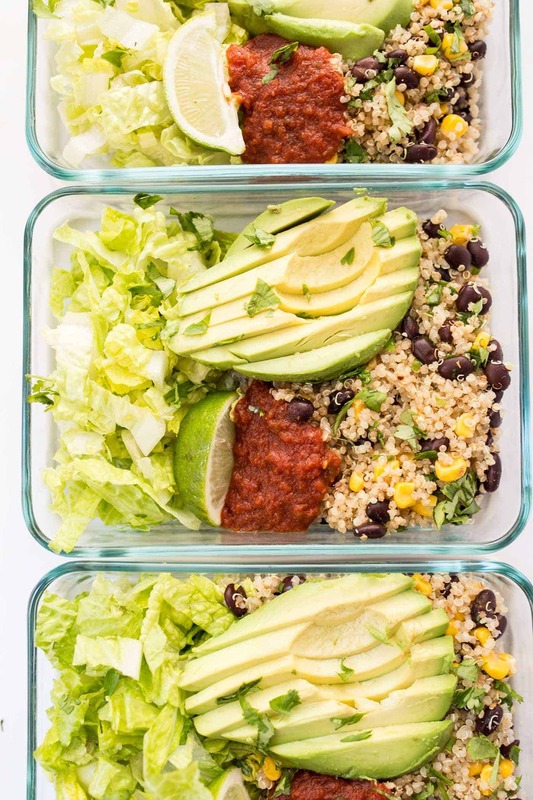 These easy vegetarian quinoa burrito bowls are the perfect recipe to meal prep for a healthy lunch or dinner. It makes 5 days worth of food in less than 20 minutes, is packed with nutrients and tastes delicious! I've honestly never really been a meal prep person. I tend to go with the flow and rustle something up for lunch or dinner based on what's in my fridge, but what I've noticed is that when time is crunched and I'm feeling stressed, I don't end up making a very well balanced meal. So when I started seeing all these meal prep recipes pop on Pinterest and videos on my Facebook feed, I got intrigued. Would meal prep help ensure I'm eating healthy, balanced meals? Or is it going to take a ton of time and not really be worth it? The only way to answer that question was to give it a try! I decided to start simple and go with an easy lunch option. 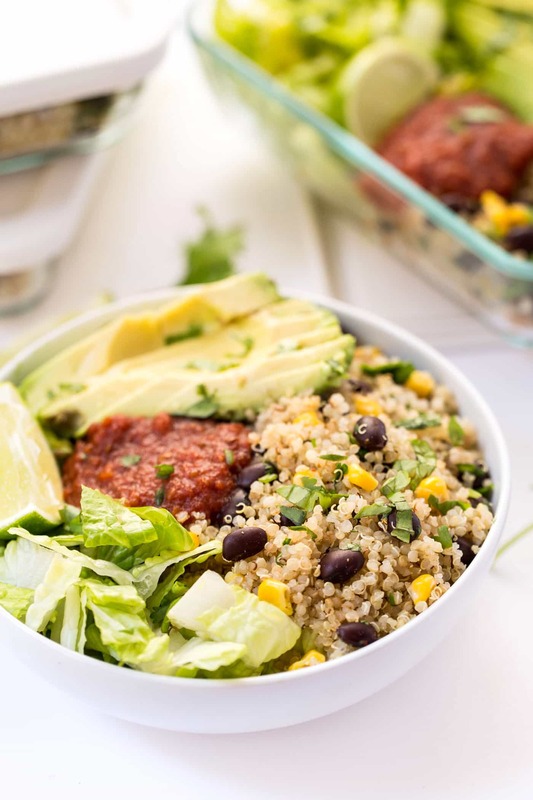 I whipped up these vegetarian quinoa burrito bowls (based kind of off my 5-ingredient Mexican Quinoa), which ended up taking me less than 20 minutes! And it resulted in 5 days worth of healthy, protein-rich meals that tasted great, kept me full and saved really well in the fridge. 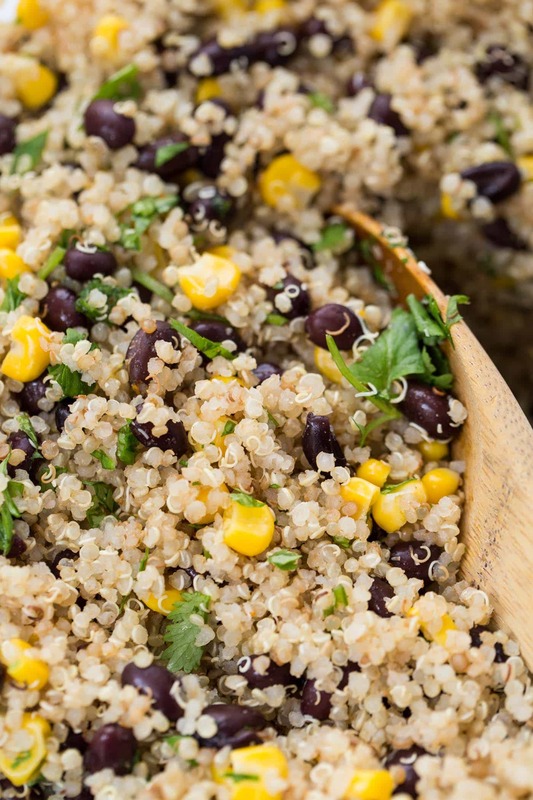 The base is a super simple quinoa salad that I've made hundreds of times but never actually shared on the blog before. 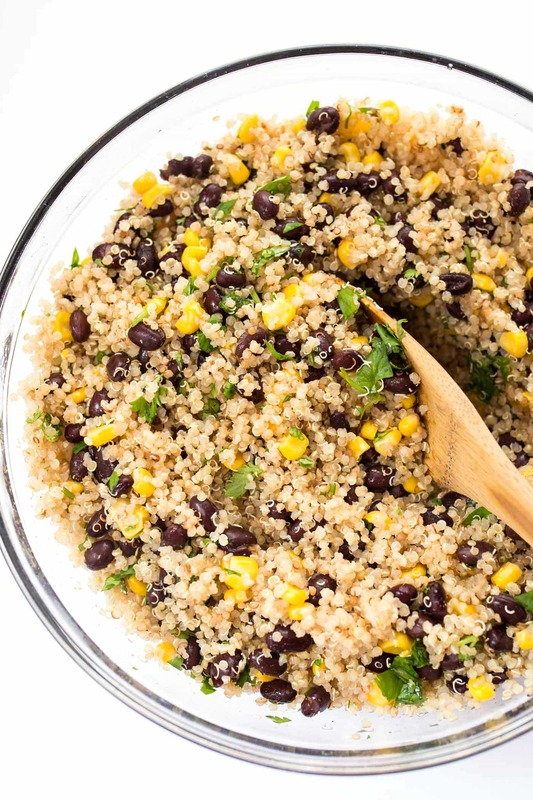 We start with cooked quinoa, add in some black beans that have been drained and rinsed, some corn (fresh or frozen), chopped cilantro and spices. And lime juice. Lime juice is key. And you basically just stir that all together and serve it up. You can serve it warm or cold, but since we're making it as a meal prep recipe, I'd recommend just serving cold, kind of like a salad. The additions to my bowl? 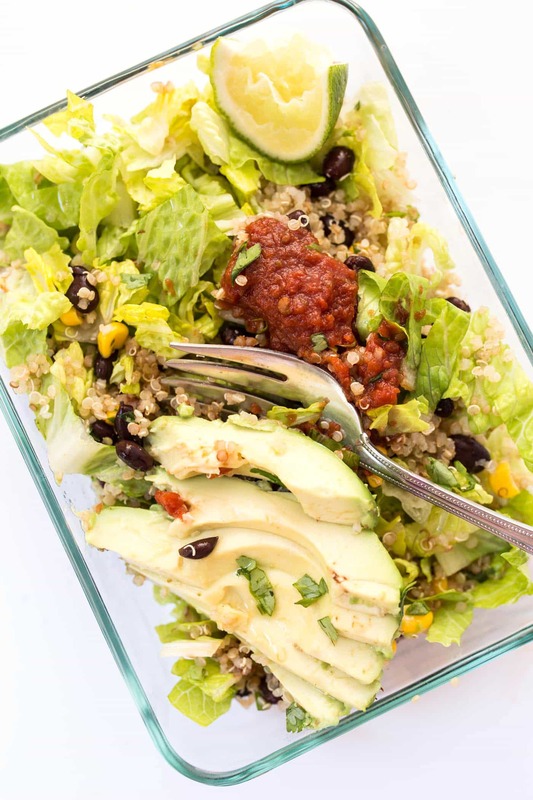 Chopped romaine lettuce, a dollop of salsa, some sliced avocado and a sprinkle more of cilantro. What I really enjoyed about these burrito bowls is that they were filling, but still light. I'm not a huge fan of having a big lunch in the middle of the day, especially when I have a day that's mostly spent at the computer. Of course, I need something that will fuel me through the afternoon, but since I'm not moving around a ton, it also needs to be fairly easy on my digestion. And this bowl was just that! Do you currently meal prep? If so, what are some of your favorite recipes? If you're looking for a little more meal prep inspiration, check out my 7-Day Vegan Meal Plan or watch the video of my Slow Cooker Coconut Quinoa Curry and see how to meal prep that recipe as well! 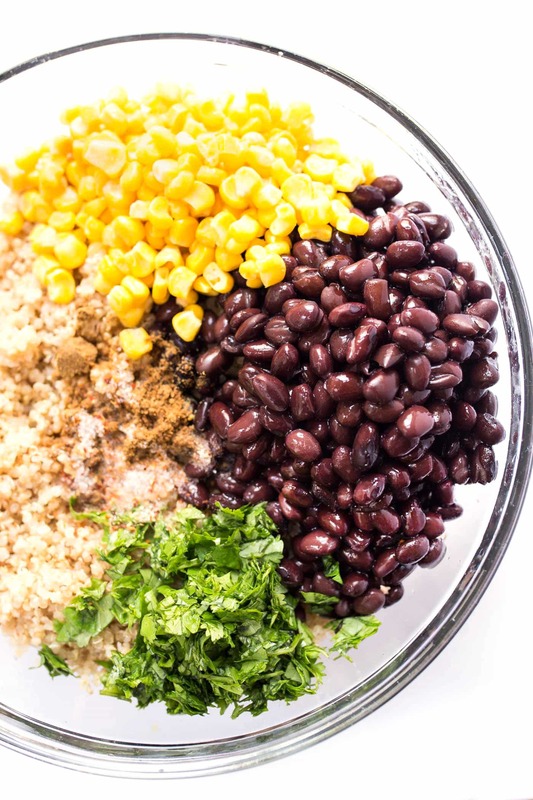 Prepare the quinoa salad by combining the quinoa, beans, corn, cilantro, spices and lime juice in a large bowl. Stir together until combined. Garnish with lime wedges and a sprinkle more cilantro if desired. Seal containers and place in fridge for up to 5 days. * recipe will leave you with 1/2 of an extra avocado. save in fridge or freeze and add to smoothies! Made these bowls. Really good. I added more lime juice and some chipotle chili pepper. Quite yummy! This was so good!! I did pretty much exactly what your recipe called except added a red onion to the quinoa salad! Added a little zing to it! I made these bowls for meal prep a few days ago, along with your Golden Milk Energy Balls. Best meal prep ever! 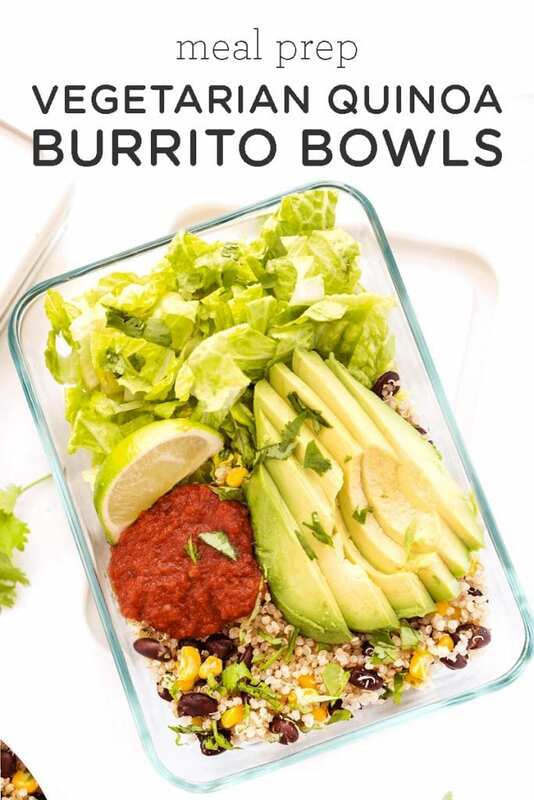 I’m eating a bowl right now and it is delicious, flavorful, and holds up well in the fridge for a long time. I will definitely be making them again! YAY!!! I’m so glad you’re enjoying them 🙂 thank you! Sounds perfect! How does the sliced avocado hold up in the fridge for five days? What size dish do you recommend? Everything fit so neatly!!! This sounds great! I’m vegetarian and trying to watch my carbs (it’s sooo easy when you don’t eat meat to replace it with bread and grains!). Do you think it would work to maybe sub half the quinoa for scrambled tofu or something similar? I totally agree! And yes, that would work OR you could try using cauliflower rice! This is the least time consuming meal prep! I still have my whole day ahead of me, which us fabulous. I love that it doesn’t have to be heated either. I am Lecturer and my husband is a polive officer and it is perfect for both of us. We feel light but full. Perfecto! Where did you get your meal prep containers? I’m looking forward to trying this recipe. I find I get so tired of cooking by Friday that I often just skip lunch (so not good!) and I’m thinking Meal Prep is the answer. I think it could be great for you! I get them on amazon 🙂 These are from Pyrex! The taste was amazing!!! So good! So, so,so, so very, very, very, very good! Thank you for all your recipes and the wealth of information you share. Aww thanks so much, Lucy! That means the world to me 🙂 And yes, definitely doing more meal prep content! Do you find that the avocado is completely brown by the end of the week? I find mine get brown even with lime juice. Love everything you do! Please keep it up!! Or, you can roll the halves completely in hemp seed to keep them green and add some protein in the process! I enjoyed watching your little video and the ease with which you prepare the separate portions, however, my appetite is strange. Whether it’s MS that I live with or the only two meds I take which if I learned affect my appetite, so preparing meals ahead of time isn’t always so great. I do make soups and sometimes if I have a soup already in leftover stage and have also prepared a casserole which is also leftover then I have two choices to choose from. I’ll see maybe will try this with leftovers of some sort sometime? Right now, did change one part of how I eat and that is chopped two small heads of cabbage red and green and several carrots putting some in veg drawer and the rest in freezer to use for soup. I can add some romaine to that and make a nice salad to eat more than once. Love your meal prep video. Now to print it out…How do I print it out? I found the list at the bottom of the video, How do I print it? Which recipe are you looking for?